Growth has been more robust but major challenges remain ď ą Japan has achieved faster growth during the past six years: o Real GDP growth in per capita terms has been close to the OECD area. o Job creation has been strong, particularly among women. 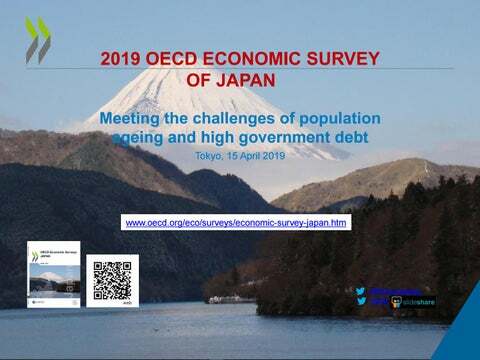 ď ą Japan faces the intertwined challenges of rapid population ageing and high government debt. o A declining working-age population is creating labour shortages. o The rising number of elderly puts upward pressure on public spending. o The governmentâ&#x20AC;&#x2122;s fiscal position remains in deficit. o Labour productivity and per capita income are well below leading OECD economies. Note: Annual average percentage change in real GDP on a per capita basis. Source: OECD Economic Outlook (database). Note: Population aged 65 and older as a share of the population aged 20 to 64. Source: OECD Demography and Population database. Note: The baseline assumes constant labour market entry and exit rates by gender for each five-year age group. In the “delayed retirement scenario”, exit rates are reduced for both men and women by 10% for each five-year age group between the ages 55 and 74. In the “closing the gender gap” scenario, the participation rates for women converge to those for men in each five-year age group. Source: OECD projections based on data from the OECD Population and Labour Force Projections database. Source: Cabinet Secretariat et al. (2018); Fiscal System Council (2018); Ministry of Internal Affairs and Communications; and OECD calculations. Note: Gross government as a percentage of GDP. OECD estimates for 2018. Source: OECD Economic Outlook database. 1. March 2019 for Japan, January 2019 for the United States and November 2018 for Sweden. Source: OECD Economic Outlook database. Source: OECD calculations based on OECD Economic Outlook No. 104 through 2020, Cabinet Office projections through 2027 (using the â&#x20AC;&#x153;Economic Growth Achieved Caseâ&#x20AC;?, which implies real growth of more than 2% and nominal growth of more than 3% a year in the first half of the 2020s) and government assumptions for growth, spending and interest rates through 2060. 1. Per capita GDP using 2010 prices and PPP exchange rates. Labour productivity equals GDP per hour of labour input. Source: OECD Economic Outlook database. Fundamental reform of Japan’s traditional labour market practices is needed • Around 80% of firms set a mandatory retirement age of 60: abolish the right of firms to set mandatory retirement. • Wages are closely linked to seniority: increase the importance of job position and performance in wage setting. • Lifetime (or long-term) employment is still prevalent: facilitate mid-career mobility. In sum, a shift to more flexible employment and wage systems based on performance rather than age would enable Japan to better utilise its human capital, including women and older persons. Source: Ministry of Health, Labour and Welfare, General Survey on Working Conditions, 2017. Source: Japanese Ministry of Health, Labour and Welfare, Basic Survey on Wage Structure (2006, 2016). Note: For full-career average-workers under current legislation. Source: OECD (2017), Pensions at a Glance 2017: OECD and G20 Indicators. Source: OECD (2018), Working Better with Age. Source: Ministry of Internal Affairs and Communications, Labour Force Survey, Basic Tabulation, 2017. Source: OECD (2018), Education Policy in Japan: Building Bridges towards 2030. Abolish the right of firms to set a mandatory retirement age and reinforce legislation against age discrimination. Break down dualism through a comprehensive strategy to reduce employment protection for regular workers, in part by setting clear rules on dismissal of workers, and expanding social insurance coverage and training for non-regular workers. Flatten the seniority wage curve by enforcing the equal pay for equal work provision in the work style reform. Raise the pension eligibility age above 65 and expand employment opportunities for older persons to reduce elderly poverty. Improve lifelong learning by making it more relevant, including for older workers, and addressing the time and financial constraints that limit participation. Strictly enforce the new 360-hour annual limit on overtime hours and raise penalties on firms that exceed it to improve work-life balance. Focus on reducing the waiting list for childcare so that mothers are not forced to leave the work force. Strengthen measures to prevent discrimination against women in education and employment. Reform tax-benefit systems so that both parents have broadly similar financial incentives to work. Provide programmes to help foreign nationals adjust to Japan, including through education. Note: Government projections in January 2019. It assumes that the hike in the consumption tax rate from 8% to 10% is implemented as planned in 2019. The primary balance is central and local governments, as a percentage of GDP on a fiscal year basis. Source: Cabinet Office (2019). Source: Ministry of Health, Labour and Welfare; Ministry of Internal Affairs and Communications; and OECD calculations. 1. In days. 2. Per 1 000 population. 3. In hospitals. Source: OECD Health Statistics database. 1. The vertical axis shows the natural log of a thousand yen. A gap of one unit corresponds to 100% difference. Source: Ministry of Health, Labour and Welfare; Ministry of Internal Affairs and Communications; and OECD calculations. .
1. Including medical non-durables. 2. Reimbursed pharmaceutical market. 3. Community pharmacy market. Source: OECD Health Statistics database. Note: A weighted average of 18 sectors, such as water supply, flood control and agriculture. Source: Cabinet Office; Ministry of Internal Affairs and Communications; and OECD calculations. Source: Cabinet Office; Ministry of Internal Affairs and Communications; and OECD calculations. Source: OECD Revenue Statistics database. 1. In Canada, the provinces can levy a consumption tax on top of the federal tax, making it higher than Japan’s 8%. Source: OECD Consumption Tax Trends 2018. Source: OECD (2018), Taxing Energy Use. Develop a comprehensive fiscal consolidation plan covering specific spending cuts and tax increases, including a further gradual rise of the consumption tax, to ensure fiscal sustainability. Take long-term care out of hospitals and shift its focus to home-based care. Reduce long-term care insurance coverage by focusing preventive care on effective programmes and removing unnecessary services for those with less severe care needs. Promote greater use of generic drugs by making them the standard for reimbursement by health insurance. Raise the co-payment rate of the elderly by establishing the ability-to-pay principle through an effective system for assessing income and assets. Improve the effectiveness of health check-ups and health guidance to lengthen the healthy life span. Promote the joint provision of local public services and infrastructure across jurisdictions and the development of compact cities. Raise the pension eligibility age above 65 to maintain a sufficiently high replacement rate, while taking measures to expand the employment of older persons. Shift the tax mix by reducing the share of social security contributions and increase the share of taxes on consumption and personal income. Remove distortions in tax and social benefit systems, such as the spousal deduction, that discourage labour force participation. Increase the coverage of firm-based social insurance and ensure better compliance with the public pension schemes. Improve the fiscal framework, including taking measures to insulate assessment of macroeconomic and fiscal forecasts and the monitoring of fiscal plans from normative policy-making responsibility. Source: Ministry of Finance, Financial Statement Statistics of Corporations by Industry. Source: Ministry of Economy, Trade and Industry, 2017 White Paper on Small Enterprises in Japan. 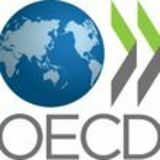 www.oecd.org/eco/surveys/economic-survey-japan.htm OECD Economics OECD Disclaimers: The statistical data for Israel are supplied by and under the responsibility of the relevant Israeli authorities. The use of such data by the OECD is without prejudice to the status of the Golan Heights, East Jerusalem and Israeli settlements in the West Bank under the terms of international law. This document and any map included herein are without prejudice to the status of or sovereignty over any territory, to the delimitation of international frontiers and boundaries and to the name of any territory, city or area.